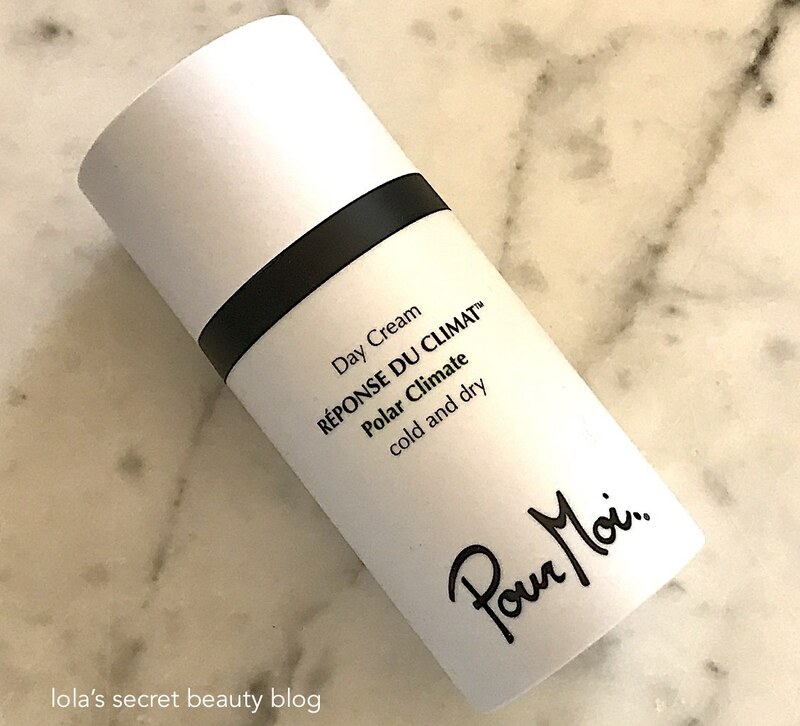 Pour Moi is an innovative skincare brand that has created the first "climate smart" range of products that are formulated to treat skin facing extreme environmental conditions– that can wreak havoc on the skin's equilibrium. Their products protect, moisturize and help the skin maintain "its natural ability to stay hydrated" and produce a youthful glow. The eight-piece skincare line, comprised of four day creams, two serums and a hydrating balancer, raises the bar on skincare efficacy by leveraging the properties of changing geographical and seasonal climates. 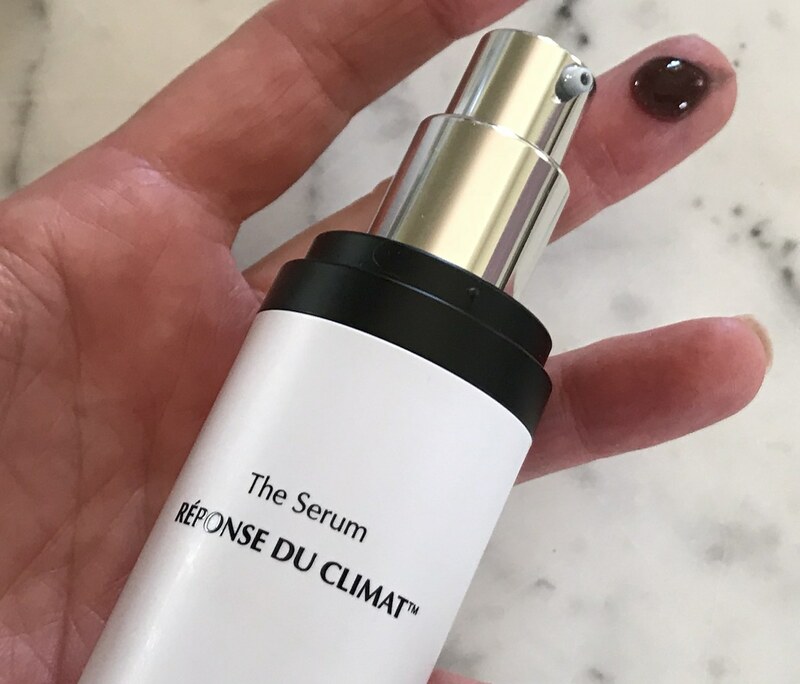 Driven by science, this advanced line introduces a brand new, patent-pending method of how to use premium skincare, utilizing climate-smart beauty technology found exclusively in the Réponse du Climat® collection. 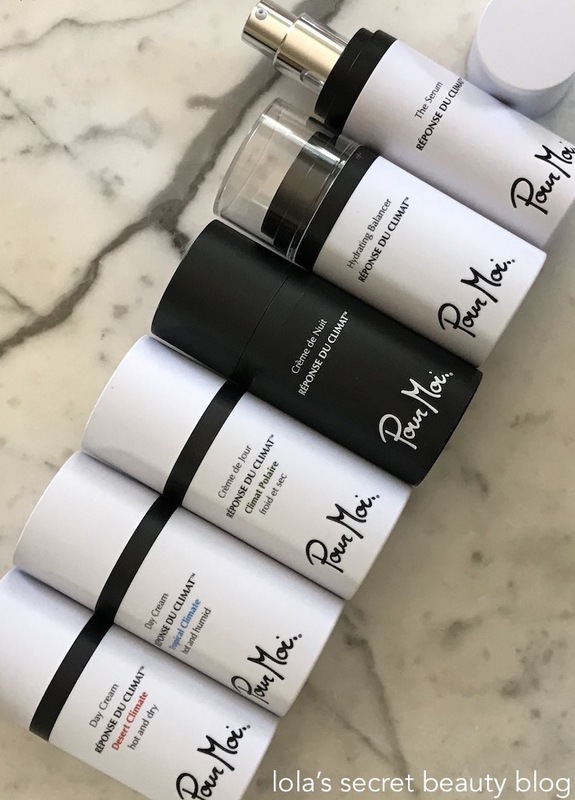 Unlike conventional skincare products, Pour Moi’s innovative Day Creams utilize the world’s first effective Climate Energized Beautifiers™ (CEBs) to follow along when skin changes with the climate. Different types of climate-smart CEBs are specifically formulated in line with specific climates to optimize skin-saving results across a wide spectrum of weather elements, man-made conditions, and pollution levels. They’re currently available in four skin-balancing blends: Temperate, Tropical, Desert and Polar. We are 100% transparent, cruelty-free, safe, and the new champions of a healthier climate, inside and out. Pour Moi Desert Day Cream ($35.00 for 1 oz. from Pour Moi and Neiman Marcus): Formulated for desert climates, this rich and yet lightweight and fast absorbing day cream, is perfectly suited for dry climates with high temperatures (75°F — 120°F) and low humidity (5% — 45%). Extreme environmental conditions such as wind, strong sunlight, pollution and the difference between air-conditioned interiors and the sweltering outdoors make this cream the perfect pick for hot and dry summers found in arid conditions. This cream is very moisturizing, and it leaves the skin soft and smooth. Pour Moi products are very concentrated, and therefore you only need a tiny bit. This contains no sunscreen, and therefore you will need to use a separate high SPF to protect your skin from the sun. It has no detectable fragrance. The climate smart Desert Day Cream is designed for those who experience desert conditions where the temperature and UV index are high but humidity is very low, and the constant exposure to air-conditioning and pollution makes matters worse for skin. This climate accelerates external skin aging. To successfully nourish and moisturize skin in this extreme climate, the uniquely formulated Desert Day Cream contains Climate Energized Beautifiers (D-CEBs) that are rich in squalane oil, oat extract, and bamboo-derived silica to lock in moisture without feeling heavy, and antioxidants and peptides round up this skin-saving formulation for maximum comfort, wellness, and glow. The Day Cream is the third step of Pour Moi's climate smart skincare ritual. Hydrates and promotes healthy lipid barrier functions for instant moisture and firmness in extreme climates such as in Phoenix, Southern California, and Las Vegas, so skin is healthier on the inside and happy on the outside. Absorbs quickly with no residue and locks in moisture. Accounts for external factors, such as temperature, humidity, man-made conditions, pollution, and weather elements, so that skin can consistently benefit from anti-aging ingredients. Directions: After the Serum has fully penetrated, apply one drop to the face and neck with your fingertips. Rotate the Desert Day Cream into your skincare routine when in desert climate. Allow the Day Cream to fully blend into your skin before applying sunscreen and/or makeup. Ingredients: Water (Aqua), Caprylic/Capric Triglyceride, Propanediol, Dimethicone, Glycerin, Oleic/Linoleic/Linolenic Polyglycerides,Methyl Methacrylate Crosspolymer, Ethylene/Acrylic Acid Copolymer, Ammonium Acryloyldimethyltaurate/VP Copolymer, Cetearyl Alcohol, C20-22 Alkyl Phosphate, C20-22 Alcohols, Phenoxyethanol, Coco-Glucoside, Sodium Hyaluronate, Tocopheryl Acetate, Glyceryl Caprylate, Tromethamine, Avena Sativa (Oat) Kernel Extract, Disodium EDTA, Alcohol, Tuber Aestivum Extract, Lecithin, Hydroxypropyl Cyclodextrin, Poloxamer 338, Sodium Benzoate, Peg-75 Shea Butter Glycerides, Silica, Ascorbyl Palmitate, Tocopherol, Potassium Phosphate, Retinyl Palmitate, Palmitoyl Tripeptide-38, Yellow 5 (CI 19140), Citric Acid. Pour Moi Tropical Day Cream ($35.00 for 1 oz. from Pour Moi and Neiman Marcus): This very lightweight moisturizer melts into the skin immediately– leaving behind no residue whatsoever. It is formulated to hydrate skin. while maintaining a healthy lipid barrier, in tropical climates that boast high heat (75°F — 120°F) and high humidity (65% — 100%). Extreme environmental factors such as high heat, high humidity, air-conditioned interiors and tropical storms make this light moisturizing feel perfect on the skin, and because it is featherweight it never feels heavy. The climate smart Tropical Day Cream is Pour Moi's lightest moisturizer designed for those who experience tropical conditions where temperature, UV index, and humidity levels are extremely high, and the constant exposure to air-conditioning and pollution makes matters worse for skin. To successfully combat these aggressors and climate challenges, the unique formula is rich in peptides, antioxidants, vitamins A, C, and E, and powerful botanicals. Tropical Climate Energized Beautifiers (TR-CEBs) made of pore-clearing coconut acid, and lightweight moisture-boosting humectants round up this skin-saving formulation for maximum comfort, wellness, and glow. The Day Cream is the third step of Pour Moi's climate smart skincare ritual. Directions: 1. Use the fingertips to apply one drop to the face and neck. 2. Allow the Day Cream to fully blend into your skin before applying sunscreen and/or makeup. Ingredients: Water (Aqua), Glycerin, Hydrogenated Coconut Acid, Isodecyl Neopentanoate, Isostearyl Alcohol, Methyl Methacrylate Crosspolymer, Butylene Glycol Cocoate, Ethylene/Acrylic Acid Copolymer, Phenoxyethanol, Saccharide Isomaerate, Sodium Hyaluronate, Acrylates/C10-30 Alkyl Acrylate Crosspolymer, Coco-Caprylate/Caprate, Squalane, Caprylyl Glycol, Ethylhexylglycerin, Avena Sativa (Oak) Kernel Extract, Sodium Hydroxide, Ethylcellulose, Xanthan Gum, Alcohol, Tuber Aestivum Extract, Lecithin, Hydroxypropyl Cyclodextrin, Poloxamer 338, Sodium Benzoate, Peg-75 Shea Butter Glycerides, Silica, Citric Acid, Sodium Citrate, Ascorbyl Palmitate, Tocopherol, Potassium Phosphate, Retinyl Palmitate, Palmitoyl Tripeptide-38, Blue 1 (CI 42090). Pour Moi Polar Day Cream ($35.00 for 1 oz. from Pour Moi and Neiman Marcus): This deeply moisturizing, and richly emollient, day cream has a surprisingly lightweight gel-like texture that immediately melts into the skin without leaving behind a greasy residue. It is formulated for cold and dry winters with low temperatures (20°F — 45°F) and low humidity (5% — 45%), where skin is exposed to the extreme difference between the very cold outdoors and heated interiors. It offers skin protection from frost, snow, wind, dry cool air and warm interiors. It has no detectable scent. The climate smart Polar Day Cream replenishes, protects, and locks in much-needed moisture in harsh winter climates. The cold, dry air naturally steals about 25% of the moisture from your skin, leaving it looking dry and lifeless. Indoor heat further robs the air of moisture, and pollution is heightened in this extreme climate. Rich in shea butter and squalane oil, the uniquely formulated Polar Day Cream contains Climate Energized Beautifiers (P-CEBs) that feature cutting-edge emollients, noncomedogenic occlusives, and botanicals to optimally care for skin for maximum comfort, wellness, and glow. The Day Cream is the third step of Pour Moi's climate smart skincare ritual. Hydrates and promotes healthy lipid barrier functions for instant moisture and firmness in extreme climates such as in Wyoming and winters in New England, so skin is healthier on the inside and happy on the outside. Directions: After the Serum has fully penetrated, apply one drop to the face and neck with your fingertips. Rotate the Polar Day Cream into your skincare routine when in polar climate. Pour Moi Night Cream ($39.00 for 1 oz. from Pour Moi and Neiman Marcus): This rich and creamy mid-weight night cream is formulated for all climates. It is a deeply nourishing and moisturizing, sinks into the skin quickly, and makes skin very soft, smooth and luminous. It locks in moisture while you sleep, helps promote skin regeneration and softens the appearance of hyperpigmentation with prolonged use. Restorative nighttime moisturizer for all climates. Supple and creamy to the touch, the Night Cream promotes optimal beauty and wellness in all climates while skin is at rest. Packed with nutrient-dense performance ingredients for deep hydration and anti-aging results, this nighttime moisturizer helps skin restore itself overnight when natural healing is at its peak. Dermatologist-recommended. Myrtle Extract prevents signs of aging with its longevity and regenerative properties. Seaweed Extract stimulates the skin to create a firm, even complexion. The reduction of dark spots and microcirculation boots skin health and appearance overnight. Shea Butter is rich in essential fatty acids, which promote skin healing, nourishing, and hydrating. Vitamin A promotes the enzyme activity of the skin and increases collagen content, helping skin to effectively regenerate. Vitamins E and C act as antioxidants to effectively reduce visible signs of aging caused by radiation. Directions: Apply one or two drops in the evening to your face and neck. Ingredients: Water (Aqua), Glycerin, Panthenol, Squalane, Butylene Glycol, Propylene Glycol Dipelargonate, Prunus Armeniaca (Apricot) Kernel Oil, Butyrospermum Parkii (Shea Butter), Hydrongenated Palm Kernel Glycerides, Cetyl Alcohol, Glycerol Stearate, Cyclopentasiloxane, Phenooxythanol, Peg-75 Sterate, Sodium Hyaluronate, Ethylhexlglycerin, Acrylates/C10-30 Alkl Acrylate Crosspolymer, Ceteth-20, Chlorphenesin, Steareth-20, Dimethiconol, Hydrongenated Palm Glycerides, Sodium Hydroxide, Tocopheryl Acetate, Xanthan Gum, Alcohol, Tuber Aestivum Extract, Lecithin, Disodium EDTA, Chlorella Vulgaris Extract, Hydroxypropyl Cyclodextrin, Peg-75 Shea Butter Glycerides, Ascorbyl Palmitate, Tocopherol, Potassium Phosphate, Retinyl Palmitate, Palmitoyl Tripeptide-38, Citric Acid. Pour Moi Black Serum ($65.00 for 1 oz. from Pour Moi and Neiman Marcus): This serum is formulated to replenish and moisturize dry, dehydrated skin. It boasts antioxidant-rich ingredients coupled with Hyaluronic Acid to nourish the skin while maintaining hydration. It gently plumps fine lines, lifts and hydrates while leaving skin soft, smooth and supple. It has no detectable aroma. Diamond-infused Serum breaks up dryness and promotes a healthy skin barrier. Luxurious and light to the touch, this silky Serum melts deep into the skin. Highly concentrated with restoring, hydrating, and brightening actives, the Black Serum delivers maximum beauty, hydration, youthfulness, and glow. Dermatologist-recommended. Peptides, Antioxidants, Vitamins A, C, and E, Botanical Extracts, three types of Hyaluronic Acid, rare forms of White Truffle Extract, and other moisturizing agents synergize together to reduce inflammation and promote a healthy skin barrier. Fine black Diamond Powder boosts collagen and lightly exfoliates skin to remove dry flakey skin and dead skin tissue. This luxury ingredient pushes other active ingredients deeper into the skin past the dry, stubborn layers. Squalane Oil is powerful for dry skin because its moisture is immediately absorbed into the dry layers. It’s fast-penetrating so it doesn’t clog pores—instead, it heals skin from the inside to promote elasticity and reduces fine lines. Thiotaine is an antioxidants that fights free radicals—skin-damaging molecules derived from pollution and sunlight responsible for premature aging. Directions: Pump a small drop onto fingertips and apply immediately after the Hydrating Balancer while skin is still moist. Soft pat and smooth product into the face and neck. Allow the Serum to fully penetrate before applying a climate smart Day Cream. Ingredients: Water (Aqua), Glycerin, Peg-8, Peg 40 Hydrogenated Castor Oil, Pentylene Glycol, Polyacrylic Acid, Phenoxyethanol, Sodium Hyaluronate, Citric Acid, Sodium Hydroxide, PPG-26-Buteth-26, Chlorphensesin, Myrtus Communis Leaf Extract, Disodium EDTA, Tuber Aestivum Extract, Ethylhexyl Methoxycinnamate, Ethylhexyl Salicylate, Ethylhexylglycerin, Calcium Aluminum Borosilicate, Sodium Benzoate, Yellow 5 (CI19140), Red 33 (CI 17200), Blue 1 (CL42090), Silica, Titanium Dioxide (CI 77891), Palmitoyl Tripeptide-38, Diamond Powder, BHT, Ergothioneine, Tin Oxide. Pour Moi Hydrating Balancer ($29.00 for 1 oz. from Pour Moi and Neiman Marcus): This pH balanced, alcohol-free hydrating skin balancer, gently exfoliates dead skin cells with Glycolic Fruit Acids, Lactic Acid and Salicylic Acid while Vitamin A helps increase collagen to regenerate new cells. While many exfoliating products have a tendency to dry out and dehydrate the skin, this one actually hydrates, conditions and softens the skin. It has no detectable aroma. Advanced liquifier for instantly smoother, softer skin and improved product efficacy. Advanced liquifier for instantly smoother, softer skin and improved product efficacy. Citric Acid and Sodium Hydroxide adjust the pH level of the acid mantle to prevent and reduce the signs of aging, inflammation, breakouts, and sensitivity. Restoring a healthy pH level of the skin has instant skin benefits: gently removing dead skin cells, promoting new cell regeneration, soothing irritation, and hydrating deeper layers of the skin. Glycolic Fruit Acids eliminate dead skin cells and evens out skin tone. Vitamin A increases collagen so skin can effectively regenerate new cells, and the combination of Vitamins C and E acts as antioxidant agents to reduce and prevent radiation-related skin aging. Pro-Vitamin B5, also referred to as D-Panthenol, heals wounds and reduces inflammation. Glycerin maintains skin’s water balance to promote effective hydration. Directions: 1. Apply Balancer to clean skin by using a cotton pad. 2. Place dry cotton pad on the flat applicator and pump once or twice. 3. Then swipe moist cotton pad gently over your face and neck. Ingredients: Water (Aqua), Lactic Acid, Glycerin, Peg-40 Hydrongenated Castor Oil, Panthenol, Pentylene Glycol, Butylene Glycol, Sodium Hydroxide, Fomes Officinalis (Mushroom) Extract, Phenoxyethanol, Salicylic Acid, Chlorphenesin, Hydroxyethylcellulose, Sodium Hyaluronate, Disodium EDTA, Tuber Aestivum Extract, Hydroxypropyl Cyclodextrin Sodium Nitrate, Palmitoyl Tripeptide-38, Red 33 (CI17200), Citric Acid. Overall Assessment: I am quite impressed by this innovative line, and highly recommend their products to eradicate the effects that extreme environmental conditions have on the skin. Whether you live in an extreme climate, or will be vacationing in one, Pour Moi has just what you need to treat and care for your skin in those conditions. I agree, it is quite innovative, and the products are lovely. The Black Serum is the one that really caught my eye as well. I really like it a lot! It's definitely worth checking out their products! I'm happy to see they are cruelty free! I've heard of this brand, but never tried it. It's a really interesting concept, and I really like their products a lot! A black serum? That's so interesting. I wouldn't know which climate to pick though. I guess my local NM would make a recommendation. It really is an interesting, and effective serum. I am quite impressed by their products! Speaking to someone at NM would probably help, but I think that it is pretty easy to evaluate the needs of your skin and the type of weather that you are experiencing seasonally, and selecting the appropriate products based upon those particulars. I think that you would really like the textures and efficacy of these products, and you will be pleased to know that none of these products have any real detectable scents. I love that they are formulated according to climate! Genius! It is such a novel and innovative approach to skincare!